Natya Parijatha: Gurus provide vigorous training and evaluation. The students attain in-depth knowledge of the art form and are able to develop a deep interest. They are taught of the origin, history, and values of the art form. They are taught Nattuvangam, Choreography, and Practical Application of Yogic mudra's in dance. Sangitha Parijatha: Gurus provide vigorous training and evaluation. The students attain in-depth knowledge of the art form and are able to develop a deep interest. They are taught of the origin, history, and values of the Indian Culture. They are taught Voice Culture, Modulation, intonation and correct use of Language in Singing. Natya Koumudi: The students better their skills of Kuchipudi and learn the intricacies of the art form. They attain finesse and are able to prove themselves in demanding environments. Sangitha Koumudi: The students better their skills of Carnatic Music and learn of the intricacies of the art form. They attain finesse and are able to prove themselves in demanding environments. Natya Visharada: This program aims at providing a learning experience that’s beyond the basics and provides extended exposure to the art form, both theoretically and practically. Sangitha Visharada: This program aims at providing a learning experience that’s beyond the basics and provides extended exposure to the art forms, both theoretically and practically. Qualification: 10th Class, Certificate/ Equivalent Course, Bachelors Degree. 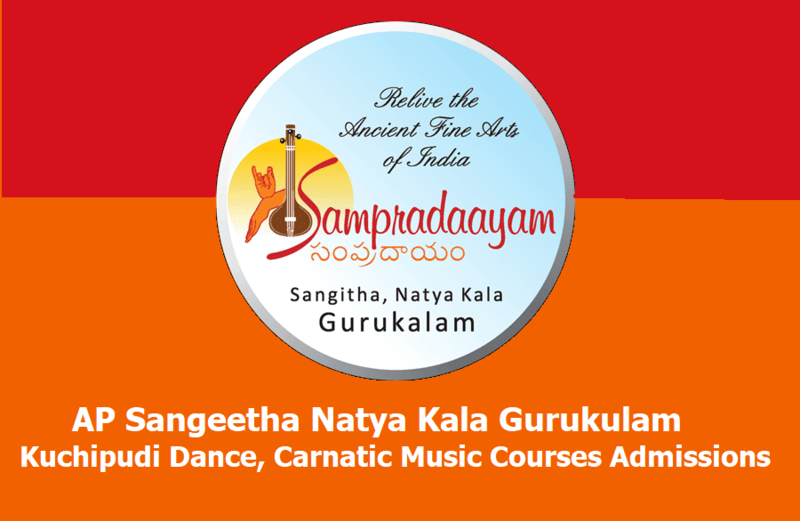 Sampradaayam fulfills the concept of COMPLETE EDUCATION in Kuchipudi Dance and Carnatic music both in theory and practicals. The idea is to create great exponents in dance and music like Smt Yamini Krishnamurthy and Dr Mangalampalli Balamurali Krishna. Besides education in dance and music sampradaayam also provides academic education in Bachelor’s degree and Master’s Degree in selected Courses through Distance Education. Day Scholars- 150/- per month. How to apply: Applications can be downloaded from website or Bio-Data can be sent by Post/ Mail to Director Sampradaayam Sangeetha Natya Kala Gurulam, Kallepally Village, Mofusbandar Post, Srikakulam District. Last date for the submission of application: 30.04.2019.